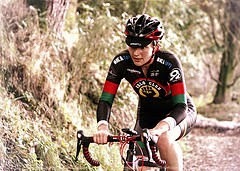 Scottish Cyclocross Association: Scottish Cyclocross- Jackson Makes it Two in Bute. 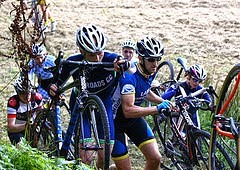 Scottish Cyclocross- Jackson Makes it Two in Bute. The second running of the Butecross event proved to be a hot and sweaty affair, giving Scottish cross racers the rare opportunity to bare some flesh before the weather takes a turn for the worse and they are up against the elements in the Ridley/Lazer Scottish Series in 2014. One person who was never up against it however was new Butecross organiser Jim Cameron, who laid on a testing but fair parcour for seasoned racers and novices alike. The fast but technical course had some superb run-ups, twisty single track and even a football stadium setting to start and finish proceedings. The fifty minute race proved to be the ideal last minute training race for Stevie Jackson (Glasgow United) who simply tore the heart out of the race to take a popular second win over his fellow United rider Hans Forhaug. 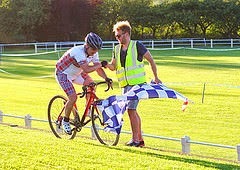 The last spot on the podium was secured by International Fell Runner Tom Owens, who has ably swapped to pedal power. The race for places further down the order proved just as thrilling with early Women's leader Lyndsey Carson (Thomsons Cycles) scuppered by a puncture, leaving an on form and in training for the Three Peaks Ainsley Turbitt (Velo Club Moulin) taking a popular win from Nicola Johnson (Hervelo) and an unfortunate Catherine Logan (Walkers Cycling) who was well placed before some mechanicals and race tumble. The Butecross race bosted a 50 plus entry, and judging by the positive feedback for the event, its popularity will surely grow for next year, as it is now firmly established as part of the Rothesay Cycling weekend. Jim and his team would like to thank the following for making the event a success. 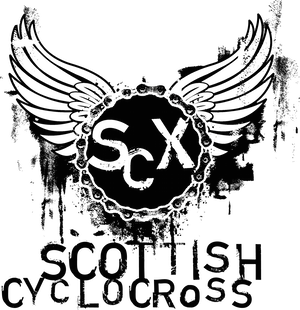 : Walkers Cycling, Gordon Watt, Bute Brewing Co, Soigneur Embrocation and the Bute Wheelers for all the help on the day.